Robert Mueller long past objectivity in the so-called investigation of Russian collusion. And there is a reason for this. Mueller will eventually be implicated in this massive cover-up. Yes, the Democrats’ biggest fixer soon joins other disgraced Obama administration minions who tried to overturn our election. I thought Michael Flynn would bring down Mueller. Recall that Flynn has been allowed to skate with a caveat: keep your mouth shut. It’s like a man freed from prison due to new evidence. He’s generally so happy he will sign anything to get his freedom back. Frankly, I believe after we know more, all Mueller deals will be null and void. Then people will sue. Corsi is as much a criminal conspirator as Ghandi. And Mueller knows it. So far Mueller has coerced “confessions” out of people in the most circuitous ways imaginable. If the deli manager at your supermarket were questioned by Mueller, he would plead guilty within a day. Yes America, things really have become this comical. So I support Corsi’s challenge 100 percent. And I hope a Trump judge–Yes Justice Roberts, there is such a thing–gets the case. Somebody needs to clip Mueller’s wings. And while Jerome Corsi doesn’t own scissors large enough, I know somebody who does. I wrote recently that President Donald Trump now tires of Mueller’s shenanigans. 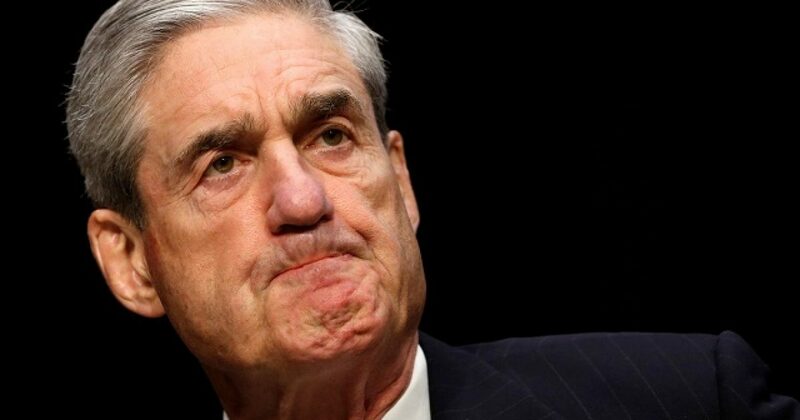 Robert Mueller continues his witch hunt for one reason: when he stops, the Democrats are doomed. The Democrats’ entire future rests on Mueller’s ability to perpetrate the illusion of Russian collusion. This “investigation” is far past farce. Two years plus, and not one scintilla of evidence against Donald Trump or anybody associated with him. At least, not as it involves Russian collusion in our election. Yet, all around Mueller lies evidence of Democrats colluding against Trump. And worse, there exists even more evidence of Democrat election meddling, but Mueller does nothing. One might argue that doing something about Democrats cheating in the election is outside the scope of Mueller’s investigation. However, from most vantage points, Mueller’s investigation seems to cover everything. Well, the end of the road approaches, as does the horizon. By horizon, I meant that Trump has much more road ahead than Mueller. Because unless Mueller has something really big to report, he and the Democrats will offer more questions than answers. Trump gave Mueller everything he wanted and needed to make his case. Mueller stacked the deck with Hillary Clinton-supporting “investigators”. Moreover, Trump and his entire staff have cooperated completely. Then Mueller expanded his scope to ridiculous levels. With all this, he offers nothing. So Trump gave Mueller rope to hang himself, but Mueller stalls on his suicide. But he knows the end game, because Trump has the guy on the mat. Compare how Trump and team behaved versus Hillary Clinton’s team and that of Obama’s. You get the picture. Still, Trump keeps one dry bullet, or perhaps it’s a nuclear bomb. He’s threatened to expose the dirty underbelly of Leftist politics if pushed. It appears the Democrats may be mitigating things with leaks. They hope that by the time Bush’s funeral is over, the leaks will appear to be old news. Sadly for them, that won’t happen. Far too many Americans have waited for justice to be served cold on the elites. And our wait will soon be over.